Walmart's latest digital move to compete with Amazon will make reordering frequent purchases easier for its online shoppers. The retailer announced an “Easy Reorder” feature, which registers Walmart purchases and saves them to a shopper’s purchase history. "Easy Reorder" is available on desktops and in the retailer's mobile app, and builds a list of items purchased often, in order of frequency. The spin is, Walmart once again makes use of its physical stores to compete with Amazon, blending its digital and in-store experience for shoppers. 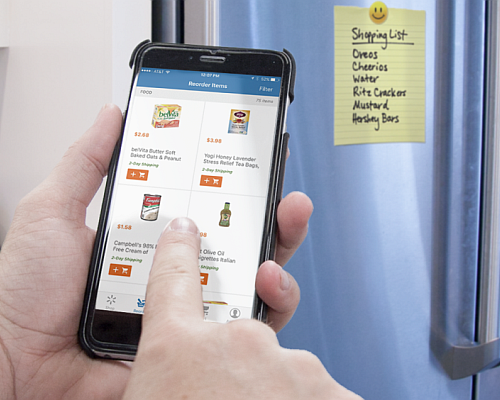 "Here’s the cool part: We’re integrating both in-store and online purchases to provide you with a single spot to view (and repurchase) the items that you buy most frequently – items like dog food, cereal, shampoo and diapers," wrote Jordan Sweetnam, VP, Customer Experience & Product, Walmart Global eCommerce, in a company blog post. According to Sweetnam, "Easy Reorder" contributed to the growth Walmart saw in its first quarter. It also gives the retailer data as to what shoppers are reordering the most. The feature is now available for purchases at any of the company’s 4,700 stores U.S. stores, as well as Walmart.com.